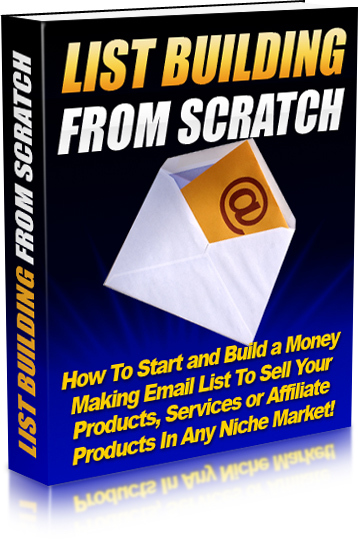 How to Start and Build a Money Making List To Sell Your Products, Services or Affiliate Products In Any Niche Market. How would you like the thought of having your very own list of hungry subscribers you can mail out to anytime you want? Every "guru" and so called "marketer's" out there are telling you to build a list, build a list, build a list, the money's in the list. You already know how valuable and powerful having your own list is - You literally make money by sending out an offer to your list of subscribers, providing you share valuable content. NO clue where the heck to start? Considering there's so many things you need to know - Autoresponders, opt-ins, newsletters/ezines, writing emails that sell, what to offer to your list, monetizing your list, how to get subscribers to open your emails, best times to email and more. It's a pain in the rear! So I've done something about it, and I'd like to share it with you.